**Census metropolitan areas (CMA) are formed by one or more adjacent municipalities centred on area (known as the urban core). A Census metropolitan area (CMA) must have a total population of at least 100,000 of which 50,000 or more must live in the urban core. Urban non-census metropolitan areas (non-CMA) are smaller urban areas with a population 100,000. 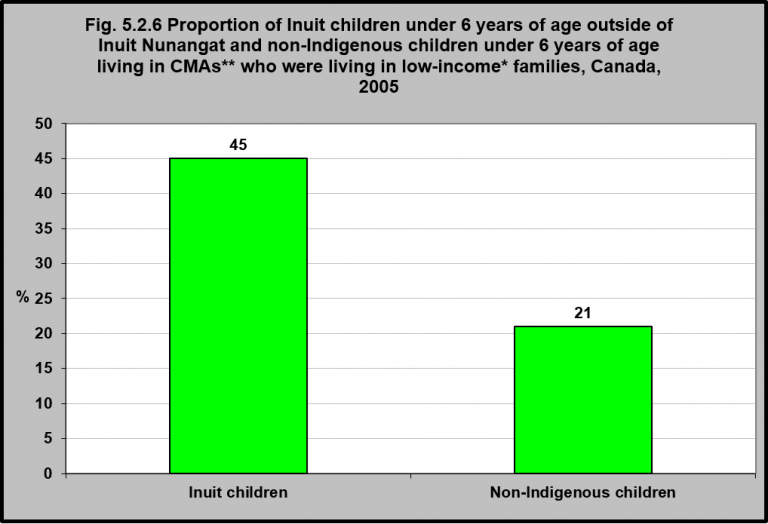 In 2005, almost half (45%) of Inuit children outside of Inuit Nunangat under 6 living in census metropolitan areas (CMAs) were living in low-income families. This was a little more than double that for non-Indigenous children under six living in CMAs (21%). 1Statistics Canada. Inuit Children Under Six Years Old. http://www.statcan.gc.ca/pub/89-634-x/2008004/article/6500048-eng.htm -accessed November 15, 2017. 2Inuit Nunangat is the homeland of Inuit of Canada. It is comprised of four Inuit regions: Nunatsiavut (northern coastal Labrador), Nunavik (northern Quebec), the territory of Nunavut and the Inuvialuit region (northern Northwest Territories). These regions collectively encompass the area traditionally occupied by Inuit in Canada. Statistics Canada. 2016. Inuit: Fact Sheet for Inuit Nunangat. Catalogue no. 89-656 X2016014. http://publications.gc.ca/collections/collection_2016/statcan/89-656-x/89-656-x2016014-eng.pdf -accessed November 15, 2017. Like off-reserve First Nations and Métis children, Inuit children under 6 years of age living in large urban centres/census metropolitan areas (CMAs) are also considerably more likely to be living in low-income families (more than twice as likely) compared to non-Indigenous children.